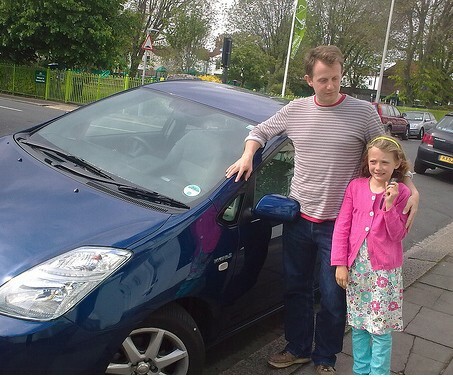 As we mentioned in our post on Friday, we’ve been having fun test driving a second-generation blue Prius over the weekend – and will continue to do so over the rest of the week. Yesterday my family and I gave the car a run out on a trip to a nice pub for Sunday lunch for a friend’s birthday. The day started off sunny so we were planning to have a blast out into the countryside as well, but this being the UK, it was raining by early afternoon. So instead we did some urban trundling with a quick charge along the A27 outside Brighton just for good measure. My husband was sceptical about the car, truth be told. (This was partly reinforced when he spent the first 10 minutes after picking the car up trying to work out why it kept beeping at him and he couldn’t get it to move. He’d failed to read the manual properly or to notice that the handbrake is, in fact, a foot brake. Luckily his boss drives a Prius so we were able to phone him and get personal tuition on how to get the car moving!) But within minutes of setting off he’d been won over by the SILENCE. And the fuel efficiency. My daughter, however was a Prius advocate from the moment I confirmed that it is an “eco car”. Now, I know this is a highly contentious description for a car – but she’s been learning all about the combustion engine and the impact of our use of fossil fuels on CO2 levels at school (she’s eight – the modern curriculum eh?) and as a result she is pretty au fait with hybrid technology. It was her that labelled it an “eco-car”. And who am I to argue? She pretty much has the future of personal transport planned out – according to her we’ll all be driving cars that run on batteries and picking up a newly-charged one (and dropping off the one we’ve just used up to be re-charged in due course) at a battery station instead of filling up on petrol at a petrol station. Anyway, she liked Prius before she saw it because CO2 is a big deal for her. Once she found out that it could park itself – she was completely sold. I have to say, one of my favourite parts of the trip was watching as passers-by stopped and stared as we set the auto parking assist up and then sat back and let the car do the parking. It was great. But what I was really struck by was how relaxing it is to sit in a car that is so quiet and, how can I put it, in control. My husband confirmed that this wasn’t just me being all “fluffy”. He reports that the cruise control function – something I’d always thought was for motorways – made driving round the city a much less stressful experience. I’ve asked him to explain about that soon. Add to this the fact that we got his folding bike and a friend’s overnight bag in the boot with tons of room to spare, and we were very much persuaded that Prius is a real option for our next family car. (We’ve just retired our ever-faithful 10-year-old Mondeo). You can see the pictures from our day of driving at the new Toyota UK Flickr pages here. There’ll be more test drive updates from the rest of the Today / Tomorrow gang later in the week – we’ll be Twittering what we get up to as well, via @Toyota_UK_Prius. And there’ll even be a video of our self-parking experience here in a day or two, too.